A critical step in implementing a new water purification system is handling the installation of the equipment and system. From developing a transition and installation plan to figuring out the specific requirements and access, installation could be a hassle of loss of production time. 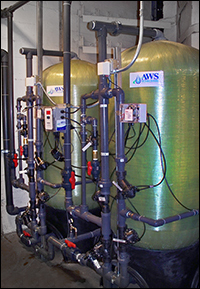 At All Water Systems, our years of industry experience make developing a comprehensive plan to install a new piece of equipment or an entire system hassle free. We have been installing and removing systems for over 30 years and have worked in a wide range of industries. This helps us to estimate and plan for everything from space and access issues to timing and transfer times. We can even plan to have a rental system or single piece of equipment to cover the transition period without any loss of production time or water quality. Taking time to fully understand your entire water purification situation and needs allows us to plan accordingly not just for building the system but how to install the system with the least amount of interruption. We also provide complete training and on-going maintenance plans to ensure your system is not only installed properly but will operate at peak performance for years into the future. Our water purification installations save you time and money and offer the best benefit of all, peace of mind that the job is done right the first time. For more information about water purification equipment and installation, call us at (412) 824-6560, or click here to contact us.